OK, so I have this Natural Health drink that my mom never forget to put in my baggage going back to Singapore after a vacation in Philippines. She also never fails to remind me to drink it and take good care of myself on her emails. First Vita Natural Health Drink Dalandan is claiming that it can meet your requirements of minerals, vitamins, antioxidants and immunity enhancing phytochemicals. It’s flavor – Dalandan (Citrus aurantium) made it different from the other health drinks. 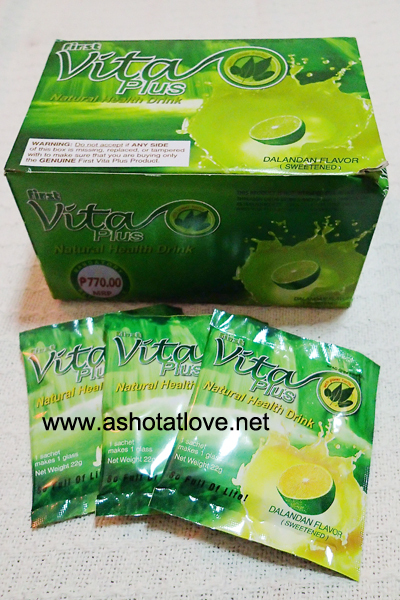 First Vita Plus Health drink is not made available in the market but only through dealership. Work is more tiring now that we’ve been under staff for quite sometime. I can’t even remember the last time I had two days off. So far, Vita Plus has been a great help to relive my stress. Like multi-vitamins, it should be drink once a day but I only drink it whenever I don’t want something plain along with my meal and when I don’t feel good. I haven’t been totally sick. First Vita Plus is an all-Filipino product and I am proud that we can do something as health effective as this product. You may contact Maura L. to order at +639236994730 and check their website on this link. I bet my mom will be very happy when she reads this because I love to disagree on her about things, hehe. Well, mom really knows best.